Happy New Year! I seem to have completely neglected the month of December when some choice baking took place. I was however blessed with a new recipe book titled Mini Donuts: 100 Bite-Sized Donut Recipes to Sweeten Your “Hole” Day (yeah, it actually does say that on the cover). I firmly believe 2013 will be the Year of the Mini Donut! 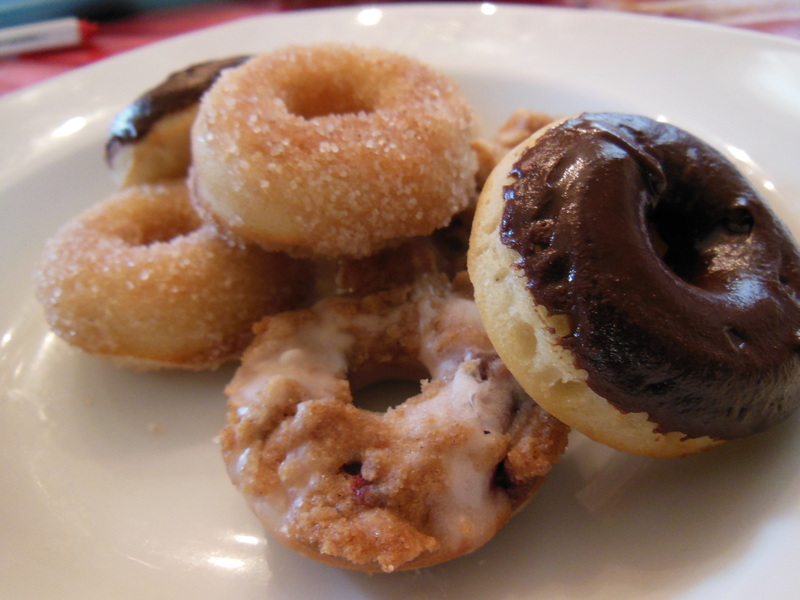 So I tried out a few donut recipes (baked, not fried) to usher in the New Year and I was not disappointed. This recipe looked to be the base recipe for a lot of the donuts (with varying toppings and such). Tastes best when warmed. Preheat oven to 350°F. Grease mini donut pans with lots of butter. In a small bowl, sift together flour, baking powder, cinnamon and salt. Set aside. In a medium bowl, whisk together the egg and sugar, then add milk, vegetable oil and vanilla, mixing until thoroughly combined. Gently stir in flour mixture until there are no lumps. 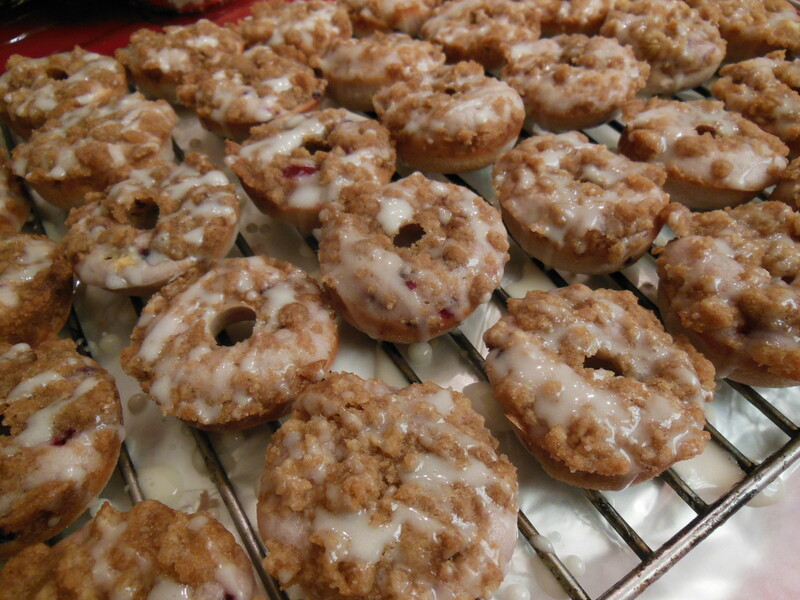 Using a piping bag, fill donut wells ¾ full and bake for 7-9 minutes. Remove donuts from pan on to a cooling rack. Prepare the topping: mix the cinnamon and sugar together in a small bowl. In a separate small bowl, melt butter. 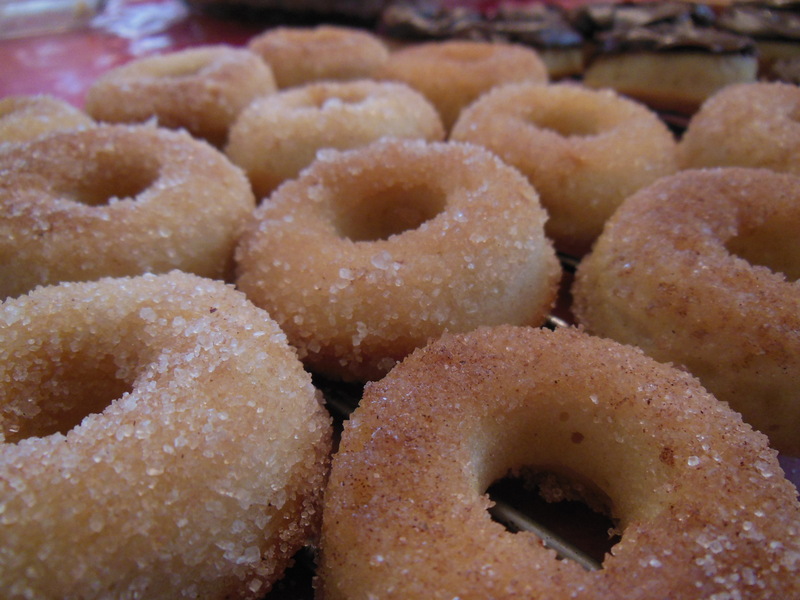 Dip the donuts in the butter and then roll in the cinnamon-sugar mixture. Serve warm. I’ll admit, I improvised this bit though the book does offer its own Chocolate Dipped version (I believe it uses a dark chocolate ganache). My method uses a hardening chocolate. Prepare Cinnamon Sugar Mini Donuts but do not make the cinnamon sugar topping. To make the hardening chocolate topping, all you need is ½ cup semi-sweet chocolate and 2 tbsp of butter. Heat to melt the butter and chocolate in a microwave and stir to dippable consistency. 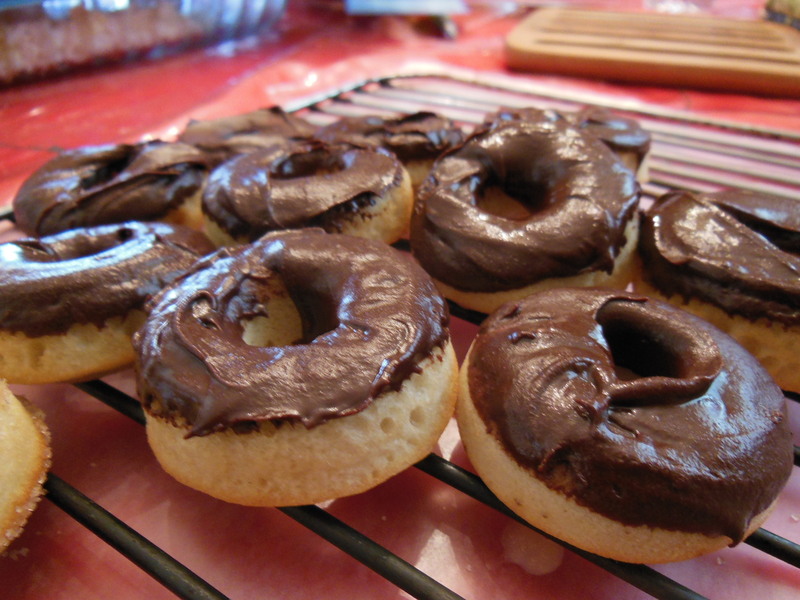 Dip tops of donuts into the chocolate. Wait until chocolate is cooled (optional). This recipe was actually my first attempt and it was a success with my mother who was serving it at an after dinner party with her friends. I chose this recipe because Lord knows how many times I’ve served a group of 60-somethings and they always complain that a dessert is “too sweet”. This seemed like the best choice. Preheat oven to 350°F. Grease donut pan with lots of butter. In small bowl, sift together flour, baking powder and salt. Set aside. In medium bowl, whisk together egg and sugar. Then add oil, sour cream and vanilla and mix until thoroughly combined. Gently stir in flour mixture alternating with the milk, stirring until there are no lumps. Carefully fold in the blackberries. Spoon batter into a piping bag and fill donut wells ½ full. Prepare the crumble by mixing the melted butter, brown sugar, flour and cinnamon together in a small bowl. Generously sprinkle onto each donut then bake for 7-9 minutes. Once cooled, prepare the glaze by mixing the milk, vanilla and icing sugar together. Drizzle onto each donut and enjoy!